Graphic Design work is typically mounted, not matted, for presentation. This means that you do not cut “windows” in matte board to frame the image as you would if it were studio art work such as a drawing, print or photograph. 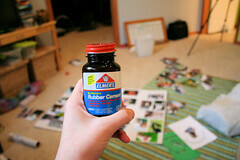 Instead, you should dry mount, spray mount or use rubber cement to adhere your work to matte board. Do not use foam core, poster board or other forms of cardboard for this purpose. Preferably the matte board is solid core black board although black board with a white back side is acceptable. Although all three goals are very important, the second of these is the one most critical and most often misinterpreted. Professional quality presentation means several things. It assumes that impeccable craftsmanship, care, neatness and cleanliness are taken. If these things are ignored then it appears that you don’t care about the work itself, so why should anyone else care either? Obviously, you don’t want this reaction to your work, so, take your time, plan carefully, be neat. The third goal of creating a neutral—yet special—visual context affects two decisions, color and size of the matte board to be used. The color choices are narrowed down to either white, neutral gray or black. Either of these might be used depending on the specific assignment or design being presented, however, black is by far the most common color choice. Size of the matte board should be one that allows for generous—not “skimpy”—margins around the work. If the matte is cut so that there are small (less than 1 1/2 ” minimum) margins then the effect is that the work is not special enough to deserve the best treatment and the designer (you) come across as cheap, both negative perceptions that are transferred to the work itself. So, the following are suggested minimum sizes for mounting your work.